One of the things about living in Chicago and having a job that requires occasional commuting to the suburbs and travel away from the city is that you lose a bit of your social life. Being stuck in traffic, a good part of your commute being done in second or third gear, and having to watch out for the ambitious drivers who rush to get to red lights and stop signs is never an enjoyable experience. Let me not get started with required travel that means you wake up in some hotel in a different time zone that wrecks your sleep and ultimately your body clock. It is impossible to have a social life and that can also become problematic for someone who has an aggressive appetite like I do. Then I bite down real hard and recognize that I have a mortgage to pay for the next twenty years. Of course, there are times when I am able to partake of some culinary adventures — albeit sometimes rushed because I am responding to some work related crisis — and I find great satisfaction in feeding my hunger monster some worthy ethnic food when I have a good stretch of free time in Chicago to enjoy the meals. A few weeks ago I was passing through the North Side of Chicago on my way to my old neighbourhood in Rogers Park. On the way, there was a certain Thai restaurant that grabbed my attention. Seeing that it was empty, I figured I would go in and enjoy a nip of something before continuing to my old stomping ground. 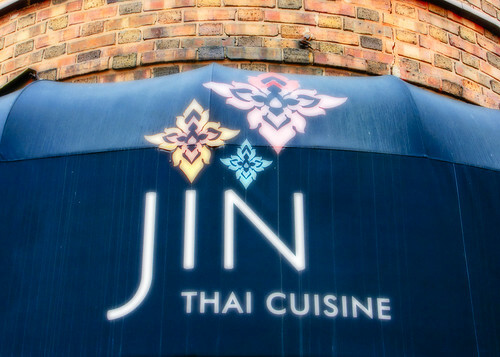 From what I could tell, the restaurant — Jin Thai Cuisine — at 5438 N. Broadway was relatively new. That had to be why there wasn’t a large crowd of patrons sitting around filling their jaws with the tasty Thai food that comes from the kitchen. During the first visit, I had ordered panang chicken that blew my mind and made my hunger monster spin out of control with bliss. From the first experience, there was no reason that I should not have returned and with my camera to capture the impression of the happiness that comes from their stove. So on my second visit, I went early and found the restaurant again light with customers. Having a window seat, I perused the menu — knowing that I was going to have an appetizer and a curry dish. I was ready for action, as always. The waitress had warned me that the servings are large at Jin Thai Cuisine. She was not there when I went the first time, so she was not aware of how I pander to my appetite, even if it means handling large portions that others would find overwhelming. I started with a Thai iced tea and let me just say that I need to return and ask for the Jin Thai Cuisine recipe specifically. Of all the Thai iced teas I have had, this was the first time that it popped for me. There are now three refreshing drinks that I could imbibe endlessly — Jamaican june plum juice with ginger, Brazilian lemonade, and Jin Thai iced tea. This red tea with milk was worthy of high marks. Mind you, when I say this I am not merely giving a shameless plug. 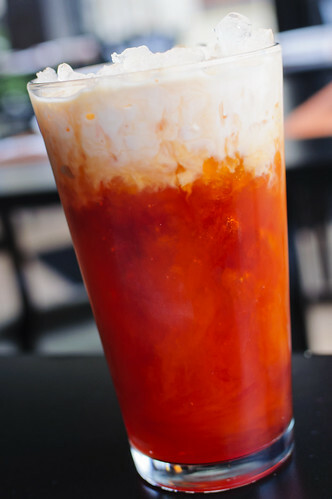 No, no, there is a great deal of satisfaction derived from sipping the Thai iced tea from Jin Thai Cuisine. First to the table was kanom buang. This was a rather large plate consisting of a crispy crepe stuffed with tofu, shrimp, coconut flakes, and bean sprouts. Served with it was a cucumber salad with a sweet and spicy dressing and a side salad that had mint in it. This plate was large enough to have been an entrée and I remembered the waitress saying that the portions were large. 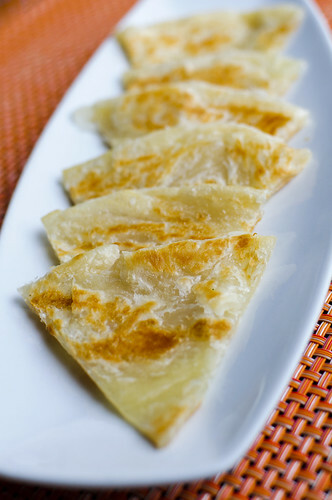 Considering the kanom buang was an appetizer, I thought that it would have been manageable. I managed to eat all of it, but she was not giving me a false statement when she had qualified her statement by saying that everything came in large portions. At first, the whole dish looked visually stunning, the colours bursting on the plate. Then I had the first bite and my eyes rolled towards the back of my head. 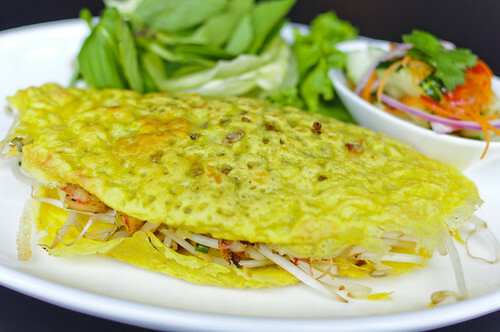 Anyone who complains about never having any kind of personal pleasure should go to Jin Thai Cuisine and order this dish. No competing flavours, just everything allowed to shine as you sink your teeth into a delightful treat that could make the French turn their noses up with bitterness for someone making their delicacy sing like Valkyries. I sat for a while before indulging an entrée. Remembering the bowl of panang chicken and jasmine rice from the first visit, I imagined the yellow curry chicken would be of similar size. Pause. And it was. But the rub with the yellow curry chicken is that it did not come with chopped Idaho potatoes in it. No, it had sweet potatoes. I am one for trying something different and when it is done correctly, there could be a break in the clouds, a ray of light shining down, and a chorus of angels singing. That was indeed the case with this bowl of yellow curry chicken. I do not think I want to have yellow curry prepared with white potatoes from this day forward. 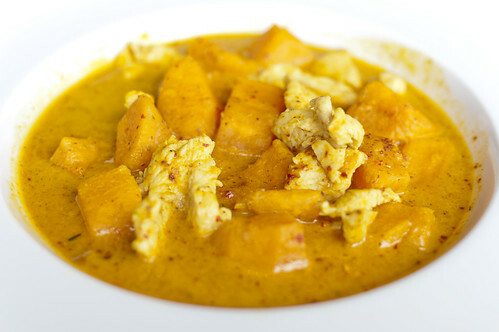 The sweet potatoes were not sweetened but their essence sweetened the curry sauce. Prepared Thai spicy style because I needed to burn out my allergies, I joined the aforementioned angels in song. Eaten with a plate of roti bread, there could have been an earthquake, people running through streets screaming, cars crashing into each other, and the winning lottery numbers in my possession, and I would not have cared. Well, let me not tell that lie about not caring about the winning lottery numbers. I may be a man with an easy appetite, but a fool is not a part of my fiber. I never would have thought that I could have had such a wonderful reaction from something as minimalist as changing up potatoes in a dish. And then I was reminded that my whole ethnic dining quests have been all about finding differences and varieties in my culinary experiences. Jin Thai Cuisine is one of those spots that I can see becoming a regular haunt for me. Yes, I know I say that in every post, which is indeed evident of me being a man with an incredibly easy appetite. There simply is no reason to shirk a restaurant that has outstanding service, delicious food, and low prices. Even if I tried, I could not come up with a reason why I should not return to Jin Thai Cuisine within the next few months at least four more times. If you live in the vicinity of the 5400 block of N. Broadway or you find yourself in that area, stop in and see for yourself. And now that I think of it, there may be a few evenings after work when I shall forego going home to get out of my work clothes and go have a suit and Thai moment at Jin Thai Cuisine. Ah, your photos make me want to make a pilgrimage to Chicago. I lived there briefly back in the fall of 2001. I never spent any time in the suburbs, but would would enjoy doing so after reading this post. The food looks super delicious! The suburbs have some gems. But you find some real winners in Chicago proper. 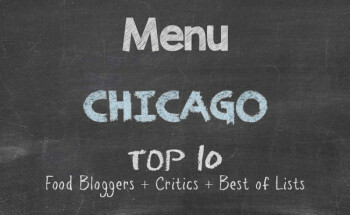 The city does an outstanding job boasting some of the best restaurants in the world.